This lovely holiday villa is for rent near the picturesque village of Grimaud on the Côte d'Azur, close to St. Maxime and only 200 m. from the beach. 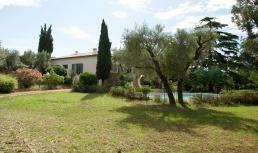 Wonderful, Provençal style villa for 12 with private pool, air conditioning, WiFi internet and sea view! This modern holiday villa is for rent near the picturesque village of Grimaud on the Côte d'Azur, only 2 km. from the beautiful beaches of Pampelonne. Recently built, modern villa with 4 bedrooms, 4 bathrooms, private pool, WiFi internet and sea view! !